Behind the Lines: Poetry, War, & Peacemaking: Edward Dougherty's "Speaking for Myself"
This is from Edward Dougherty's chapbook, "The Metal of My Mouth" and the forthcoming full-length collection Observing Silence. 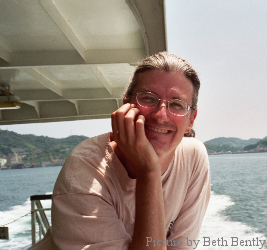 In 1993, Dougherty went to Hiroshima as a volunteer director of the World Friendship Center where he and his wife stayed for two and a half years, witnessing the fiftieth anniversaries of the atomic bombings of Hiroshima and Nagasaki. Though many of his poems attempt to probe for an imagination of peace, part of that probing necessarily means confronting the bomb inside. by the scruff of your threatened neck. I want more than is possible? take my testimony: we knew. my history. Again. Write it.